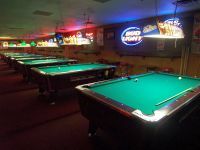 Located off Central Avenue NE and old Highway 10, Povlitzki’s is a safe, friendly place with Texas Hold’em each night of the week, quality country music and dancing on Friday and Saturday nights, and good tasty portions of food at reasonable prices. 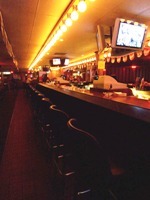 Povlitzki’s has one of the largest wraparound bars in the cities, each with a view of the many big screen TV’s. More of a blue collar beer and shot bar, but you might try their specialty, a Polish Firecracker, served in a half carafe bottle. 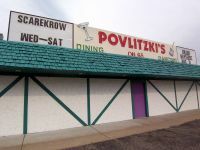 Povlitzki’s prides itself on providing quality tasty food in good portions for reasonable prices. 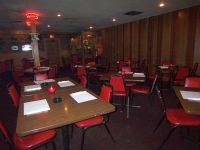 Try the burgers, club sandwich, burritos or enormous helping of nachos. TV’s are everywhere for watching your favorite sports team. 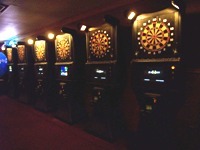 Povlitzki’s has 14 pool tables, 6 dart machines and a host of arcade games to have fun on. Lots of free parking and tons of fun, Povlitzki’s on 65 is a great place to play.